Perfect for picnics or watching the big game on the couch whichever your pleasure this 18" square pillow is just the item to do it with. 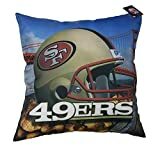 This pillow is dyed to match your favorite teams color with a large team logo screen printed in the center. The shell is Cotton Duck the fill is 100% Polyester. Availability: Usually ships within 7-10 business days.